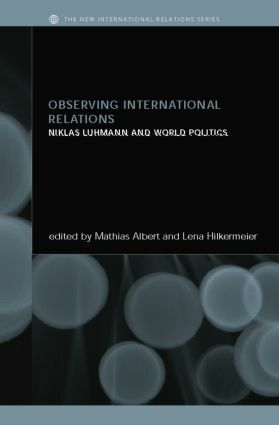 Observing International Relations draws upon the modern systems theory of society, developed by Niklas Luhmann, to provide new perspectives on central aspects of contemporary world society and to generate theoretically informed insights on the possibilities and limits of regulation in global governance. The authors develop a Luhmannian theory of world society by contrasting it with competing notions of international society, critically discussing the use of modern systems theory in international relations theory and assessing its treatment of central concepts within international relations, such as power, sovereignty, governance and war. Mathias Albert is Professor of Political Science at the University of Bielefeld where he is also a Co-Director of the Institute for Global Society Studies. His research interests include theories of world society, issues of regionalization, law-formation beyond the state, and contemporary youth studies. Lena Hilkermeier is Assistant Professor at the Faculty of Social Sciences at Ruhr-University Bochum. Her research interests lie in the fields of organizational sociology, particularly in combination with theories of society, as well as in transnationalization studies.